Accumulation and deposition of amyloid-β (Aβ) in the brain represent an early and perhaps necessary step in the pathogenesis of Alzheimer's disease (AD). Aβ accumulation leads to the formation of Aβ aggregates, which may directly and indirectly lead to eventual neurodegeneration. While Aβ production is accelerated in many familial forms of early-onset AD, increasing evidence indicates that impaired clearance of Aβ is more evident in late-onset AD. To uncover the mechanisms underlying impaired Aβ clearance in AD, we examined the role of low-density lipoprotein receptor-related protein 1 (LRP1) in astrocytes. Although LRP1 has been shown to play critical roles in brain Aβ metabolism in neurons and vascular mural cells, its role in astrocytes, the most abundant cell type in the brain responsible for maintaining neuronal homeostasis, remains unclear. Here, we show that astrocytic LRP1 plays a critical role in brain Aβ clearance. 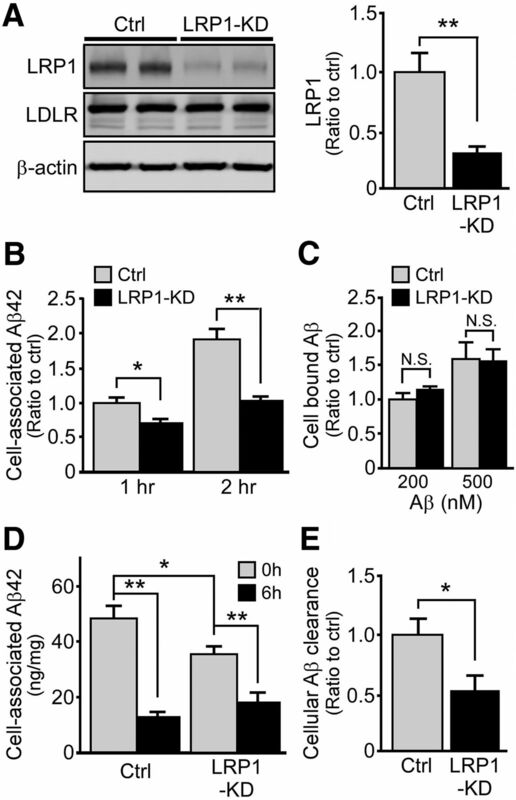 LRP1 knockdown in primary astrocytes resulted in decreased cellular Aβ uptake and degradation. In addition, silencing of LRP1 in astrocytes led to downregulation of several major Aβ-degrading enzymes, including matrix metalloproteases MMP2, MMP9, and insulin-degrading enzyme. More important, conditional knock-out of the Lrp1 gene in astrocytes in the background of APP/PS1 mice impaired brain Aβ clearance, exacerbated Aβ accumulation, and accelerated amyloid plaque deposition without affecting its production. Together, our results demonstrate that astrocytic LRP1 plays an important role in Aβ metabolism and that restoring LRP1 expression and function in the brain could be an effective strategy to facilitate Aβ clearance and counter amyloid pathology in AD. SIGNIFICANCE STATEMENT Astrocytes represent a major cell type regulating brain homeostasis; however, their roles in brain clearance of amyloid-β (Aβ) and underlying mechanism are not clear. In this study, we used both cellular models and conditional knock-out mouse models to address the role of a critical Aβ receptor, the low-density lipoprotein receptor-related protein 1 (LRP1) in astrocytes. We found that LRP1 in astrocytes plays a critical role in brain Aβ clearance by modulating several Aβ-degrading enzymes and cellular degradation pathways. Our results establish a critical role of astrocytic LRP1 in brain Aβ clearance and shed light on specific Aβ clearance pathways that may help to establish new targets for AD prevention and therapy. Astrocytes, as scaffolds supporting brain structural integrity, represent one of the major cell types regulating diverse brain functions. Through their bidirectional interactions with neurons, astrocytes actively regulate neuronal signaling pathways in addition to maintaining synaptic homeostasis by modulating the extracellular ionic environment and providing nutrients/metabolites for neurons (Wang and Bordey, 2008; Sofroniew and Vinters, 2010; Osborn et al., 2016). Astrocytes also significantly contribute to immune responses as evidenced by their coupling with microglia in neurodegenerative diseases, including Alzheimer's disease (AD) (Sofroniew and Vinters, 2010; Meraz-Ríos et al., 2013). Indeed, astrogliosis accompanied by the upregulation of GFAP and hypertrophic processes of astrocytes surrounding senile plaques are pathological hallmark of AD (Osborn et al., 2016). AD is characterized by progressive neurodegeneration, resulting in dementia (Alzheimer'sAssociation, 2015). The accumulation and deposition of amyloid-β (Aβ) peptides cleaved from amyloid precursor protein (APP) in the brain likely are central in AD development and progression (Hardy and Selkoe, 2002; Blennow et al., 2006; Zheng and Koo, 2011). In AD brains, astrogliosis has been shown to increase linearly with disease progression, which negatively correlates with cortical thickness (Serrano-Pozo et al., 2011). On the other hand, attenuation of astrocyte activation by deleting GFAP and vimentin exacerbates amyloid plaque pathogenesis in amyloid model mice (Kraft et al., 2013), suggesting that astrocytes may play an important role in Aβ metabolism. Astrocyte-regulated Aβ metabolism involves multiple mechanisms (Wyss-Coray et al., 2003; Nielsen et al., 2010), with the low-density lipoprotein receptor (LDLR) family members, specifically LDLR-related protein 1 (LRP1), likely playing a critical role. LRP1, a multiligand single transmembrane receptor, has been shown to regulate brain Aβ metabolism (Kanekiyo and Bu, 2014), whereas its antagonist, receptor-associated protein (RAP), significantly suppresses Aβ degradation by astrocytes (Koistinaho et al., 2004). Conditional deletion of the Lrp1 gene in neurons (Kanekiyo et al., 2013), vascular mural cells (Kanekiyo et al., 2012), and endothelial cells (Storck et al., 2016) aggravates Aβ deposition in amyloid model mice. Despite the fact that LRP1 is abundantly expressed in astrocytes, the contribution of LRP1 to Aβ metabolism in astrocytes has not been well studied in vivo. Here, using cellular and conditional knock-out mouse models, we show that LRP1 deficiency in astrocytes disturbed Aβ metabolism through several pathways, leading to exacerbated amyloid pathology. Animal and preparation of brain homogenates. All animal procedures were approved by the Institutional Animal Care and Use Committee at Mayo Clinic and in accordance with the regulations of the American Association for the Accreditation of Laboratory Animal Care. Astrocyte-specific Lrp1-KO mice (aLrp1−/−) were generated by breeding the Lrp1 floxed mice (Rohlmann et al., 1998) with GFAP-driven Cre recombinase mice (obtained from NCI Mouse Repository) (Bajenaru et al., 2002), and further bred into the background of APPSWE/PS1ΔE9 amyloid mouse model (Jankowsky et al., 2004) (hereafter referred to as APP/PS1). Littermates (including both male and female mice) of control APP/PS1 and APP/PS1 mice lacking LRP1 in astrocytes (APP/PS1; aLrp1−/−) were used. In a separate experiment, littermates of control and astrocytic LRP1 knock-out mice (aLrp1−/−) without the APP/PS1 background were used. Brain tissues were dissected and kept frozen at −80°C until further analysis. Some brain tissues were fixed in 10% neutralized formalin for histological analysis. Mouse brain tissues for Aβ analysis were processed through sequential extraction as described previously (Liu et al., 2014). Cell culture, lentivirus-delivered RNA interference, and Aβ ELISA analysis. Neonatal mouse primary astrocytes and adult mouse astrocytes were prepared as described previously (Koistinaho et al., 2004; Zhao et al., 2014). LRP1-specific shRNAs were purchased from Sigma, and lentiviruses were produced in the Viral Vectors Core facility at Washington University School of Medicine. In brief, 293T cells were transfected with pLKO.1-derived constructs together with the pHR8.2 and pCMV-VSV-G packaging systems as previously described (Stewart et al., 2003). Nontarget shRNA was used as a control. Aβ levels in the mouse brain lysates were determined by ELISA (Youmans et al., 2011; Das et al., 2012) with end-specific mAb 2.1.3 (human Aβx-42 specific) and mAb 13.1.1 (human Aβx-40 specific) for capture and HRP-conjugated mAb Ab5 (human Aβ1–16 specific) for detection. The ELISAs were developed using Super Slow ELISA TMB (Sigma). FACS-based internalization and binding assays, and Aβ degradation assay. Aβ42 and FAM-Aβ42 were purchased from AnaSpec, and the experiments were performed as described previously (Kanekiyo et al., 2011). Cells were incubated with FAM-Aβ42 (500 nm) at 37°C for different period of time in DMEM with 10% FBS for internalization assay. Cells were removed from the plate using Cell Dissociation Solution (Sigma) and then washed and resuspended in PBS containing 1.5% FBS, 1% sodium azide, and 1% PFA. Cells were analyzed for fluorescence on a BD FACSCalibur machine (BD Biosciences). Unstained cells without any exposure to fluorescence were used as a control for background fluorescence. For binding assays, cells were incubated with FAM-Aβ42 (200 or 500 nM) at 4°C for 2 h, suspended by cell dissociation solution, and subjected to FACS analysis. For Aβ degradation assay, cells were allowed to internalize Aβ42 (1 μm) for 2 h at 37°C. Cultures were washed and incubated in medium lacking Aβ42 for an additional 6 h. Cells were then dissolved in guanidine in 50 mm Tris-HCl, pH 8.0, and cell-associated Aβ levels were analyzed by ELISA. Paraffin-embedded sections were immunostained using pan-Aβ (Aβ 33.1.1; human Aβ 1–16 specific), anti-GFAP (BioGenex), and anti-ionized calcium-binding adaptor molecule 1 (Iba-1) (Wako) antibodies (Liu et al., 2016). Immunohistochemically stained sections were captured using the ImageScope AT2 image scanner (Aperio Technologies) and analyzed using the ImageScope software. The immunoreactivities of GFAP and Iba-1 staining in the hippocampus were calculated using the Positive Pixel Count Algorithm available with the ImageScope software (Aperio Technologies). For double immunostaining, deparaffinized sections were preincubated with citrate buffer (10 mm sodium citrate buffer with 0.05% Tween 20, pH 6.0) at 95°C for 20 min. They were incubated at 4°C overnight with a rabbit anti-LRP1 antibody (Bu et al., 1995) and a mouse anti-NeuN antibody (Millipore) or a mouse anti-GFAP antibody (Millipore), followed by Alexa488- or Alexa568-conjugated secondary antibodies (Invitrogen) for 2 h at room temperature. The images were captured by confocal laser-scanning fluorescence microscopy (model LSM510 invert; Carl Zeiss) (Fu et al., 2016). To assess interstitial fluid (ISF) Aβ in the hippocampus of awake, freely moving APP/PS1 and APP/PS1; aLrp1−/− mice, in vivo microdialysis was performed as previously described (Cirrito et al., 2011; Liu et al., 2016). Briefly, under isoflurane volatile anesthetic, guide cannula (BR style; Bioanalytical Systems) were cemented into the hippocampus (3.1 mm behind bregma, 2.5 mm lateral to midline, and 1.2 mm below dura at a 12° angle). A microdialysis probe (38 kDa molecular weight cutoff membrane; Bioanalytical Systems) was inserted through the guide cannula into the brain. ACSF (1.3 mm CaCl2, 1.2 mm MgSO4, 3 mm KCl, 0.4 mm KH2PO4, 25 mm NaHCO3, and 122 mm NaCl, pH 7.4) containing 4% BSA (Sigma) filtered through a 0.1 μm membrane was used as microdialysis perfusion buffer. Flow rate was a constant 1.0 μl/min. Samples were collected every 60–90 min overnight, which gets through the 4–6 h recovery period, and the mean concentration of Aβ over the 6 h preceding treatment was defined as basal levels of ISF Aβ. Sample were collected through a refrigerated fraction collector and assessed for Aβ40 by ELISA as described previously (Cirrito et al., 2011). Samples were homogenized and incubated in TBS containing 1% TX-100, supplemented with protease inhibitor. The detailed procedures were performed as previously described (Liu et al., 2015). The following antibodies were used in this study: in-house anti-LRP1 antibody (Bu et al., 1995), anti-GFAP (Millipore), 6E10 (Covance) for total APP, anti-sAPPα (IBL-America), anti-human sAPPβ (IBL-America), aquaporin-4 (AQP-4; Millipore), and anti-β-actin (Sigma) antibodies. RNA isolation and real-time PCR analysis. Total RNA was isolated by using Trizol (QIAGEN), RNeasy Mini Kit (QIAGEN) and subjected to DNase I digestion to remove contaminating genomic DNA. Total RNA was dissolved in nuclease-free water and stored at −80°C. Reverse transcription was performed using a SuperScript III reverse transcriptase (Invitrogen). Primer sequences were as previously described (Liu et al., 2016). The set of actin primers was used as an internal control for each specific gene amplification. The relative expressions were quantified and analyzed by using Bio-Rad iCycler. All quantified data represent an average of samples. Statistical significance was determined by two-tailed Student's t test or ANOVA with a Tukey's post-test, and p < 0.05 was considered significant. To determine the role of astrocytic LRP1 in Aβ metabolism, we first examined whether LRP1 downregulation in astrocytes impacts cellular Aβ uptake. Using lentiviral-mediated control or LRP1 shRNA, we successfully knocked down LRP1 in mouse primary astrocytes as confirmed by Western blot (Fig. 1A). Control or LRP1-knockdown (KD) astrocytes were incubated with 500 nm FAM-labeled Aβ42 for 1 or 2 h at 37°C, and cell-associated Aβ was assessed by FACS. We found that Aβ42 uptake in LRP1-KD cells was significantly reduced compared with control cells following incubation with Aβ42 for 1 h, whereas this effect was more prominent after 2 h treatment (Fig. 1B). To investigate whether LRP1 mediates the binding of Aβ42 to astrocytes, primary astrocytes were incubated with different concentrations of FAM-Aβ42 for 2 h at 4°C to prevent cellular uptake. We found that downregulation of LRP1 did not have a significant effect on Aβ42 binding to the cell surface of astrocytes as assessed by FACS (Fig. 1C). To determine whether LRP1 mediates the degradation of Aβ, primary astrocytes were incubated with Aβ42 for 2 h at 37°C. The Aβ in the medium was then removed, and the fate of Aβ in the cells was chased for 6 h. Cell-associated Aβ42 was cleared following 6 h of incubation in both control and LRP1-KD astrocytes (Fig. 1D). However, Aβ was cleared to a lesser extent in LRP1-KD astrocytes compared with control cells (Fig. 1E). These results demonstrate that LRP1 regulates the uptake and subsequent degradation of Aβ in astrocytes. LRP1 mediates Aβ uptake and degradation in primary astrocytes. A, Mouse primary astrocytes were transduced with lentiviral mediated control or LRP1 shRNA and were analyzed 48 h after transfection. Western blotting showed that LRP1 expression was significantly downregulated in primary astrocytes. **p < 0.01 (two-tailed Student's t test). B, Primary astrocytes with or without LRP1 knockdown were incubated with FAM-Aβ42 (500 nm) for 1 or 2 h at 37°C, and the cell-associated Aβ42 was analyzed by FACS. Representative results of five independent experiments performed in triplicate are shown. **p < 0.01 (two-way ANOVA). C, Primary astrocytes with or without LRP1 knockdown were incubated with FAM-Aβ42 (200 or 500 nm) for 2 h at 4°C and analyzed by FACS. Representative results from three independent experiments performed in triplicate are shown. D, Control and LRP1-KD astrocytes were allowed to internalize Aβ42 (1 μm) for 2 h at 37°C (gray bars); parallel cultures were washed and incubated for an additional 6 h in medium lacking Aβ42 (black bars) and analyzed by ELISA. *p < 0.05 (two-way ANOVA). **p < 0.01 (two-way ANOVA). E, The decrease of internalized Aβ is estimated as cellular clearance. Data are mean ± SD. *p < 0.05 (two-tailed Student's t test). To investigate whether LRP1 modulates Aβ metabolism through extracellular Aβ-degrading proteases, such as insulin-degrading enzyme (IDE) (Leissring et al., 2003) and matrix metalloproteinases (MMPs) (Backstrom et al., 1996), we evaluated the levels of these major enzymes following LRP1 knockdown. Of note, previous studies demonstrated that MMP2 and MMP9 expressed by astrocytes mediate extracellular Aβ catabolism (Yin et al., 2006), and LRP1 regulates MMP2 and MMP9 expression in glioblastomas cells (Song et al., 2009). Upon lentiviral-mediated knockdown of LRP1 expression by >70% (Fig. 2A,B), we found that the levels of IDE, MMP2, and MMP9 were significantly reduced (Fig. 2C,D). As such, LRP1 might also affect extracellular degradation of Aβ through the modulation of these degrading enzymes. LRP1 downregulation in astrocytes suppresses the expression of major Aβ degrading enzymes. A, B, LRP1 was significantly knocked down in primary astrocytes as assessed by Western blot and real-time PCR. Data are mean ± SEM. **p < 0.01. C, D, The mRNA levels of IDE, MMP2, and MMP9 in control and LRP1-KD primary astrocytes examined by real-time PCR. Representative results from three independent experiments performed in quadruplicate are shown. Data are mean ± SEM. *p < 0.05 (two-tailed Student's t test). To examine the effect of astrocytic LRP1 deletion on Aβ metabolism in vivo, we conditionally disrupted the expression of the Lrp1 gene in astrocytes by crossing Lrp1flox/flox mice with GFAP-Cre mice (Bajenaru et al., 2002), and further bred these mice to the APP/PS1 amyloid mouse model (Jankowsky et al., 2004). To confirm deletion of LRP1 in astrocytes, we performed immunofluorescent staining for LRP1 and GFAP in adult astrocyte cultures derived from control APP/PS1 and APP/PS1 mice lacking LRP1 in astrocytes (APP/PS1; aLrp1−/−). We found the LRP1 signal was significantly diminished in GFAP-positive astrocytes (Fig. 3A). Western blot analysis also revealed significantly reduced levels of LRP1 in cortex and hippocampus of APP/PS1; aLrp1−/− mice compared with APP/PS1 mice (Fig. 3B), consistent with the notion that LRP1 is depleted in astrocytes. The remaining LRP1 expression in APP/PS1; aLrp1−/− mice likely represents those in neurons and in cells composed of cerebrovasculature. Astrocytic LRP1 deletion did not affect brain apolipoprotein E (apoE) levels in both cortex and hippocampus (Fig. 3B), whereas our previous study showed that neuronal LRP1 knock-out results in increased apoE (Liu et al., 2007), thus differentiating the effects of astrocytic and neuronal LRP1 deletion. To further confirm the specificity of LRP1 deletion, the brain tissues obtained from 12-month-old APP/PS1 and APP/PS1; aLrp1−/− mice were stained with an LRP1-specific antibody together with astrocyte-specific (GFAP) and neuron-specific (NeuN) markers. 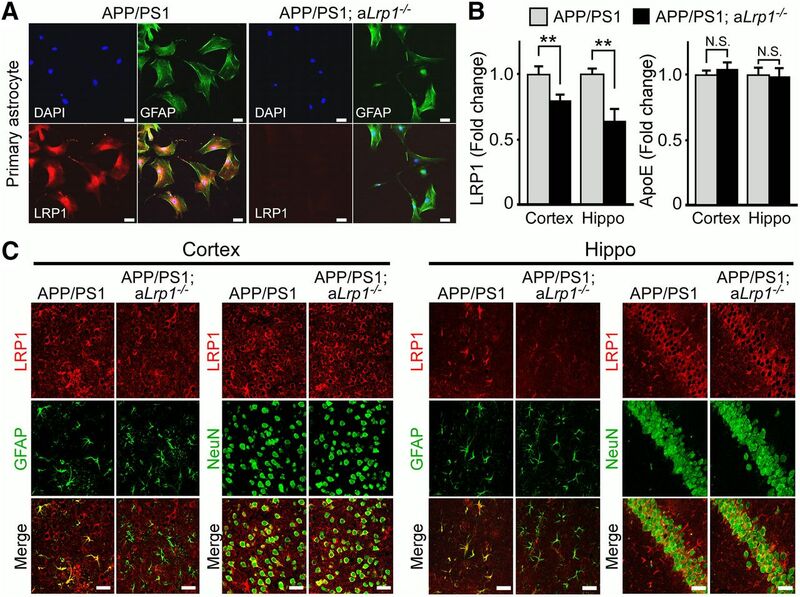 In both cortex and hippocampus of APP/PS1 mice, LRP1 was abundantly expressed in neurons and astrocytes, whereas LRP1 in APP/PS1; aLrp1−/− mice was specifically deleted in astrocytes (Fig. 3C). Importantly, immunohistochemical staining revealed that the amyloid plaque deposition in APP/PS1; aLrp1−/− mice was significantly higher than that of control APP/PS1 mice at 12 months of age (Fig. 4A). In addition, soluble Aβ concentrations were significantly higher in APP/PS1; aLrp1−/− mice than in APP/PS1 mice (Fig. 4B,C), as assessed by ELISA following fractionation of cortical and hippocampal brain tissues into TBS-soluble, detergent-soluble, and insoluble (guanidine-HCl, GDN) fractions (Youmans et al., 2011). 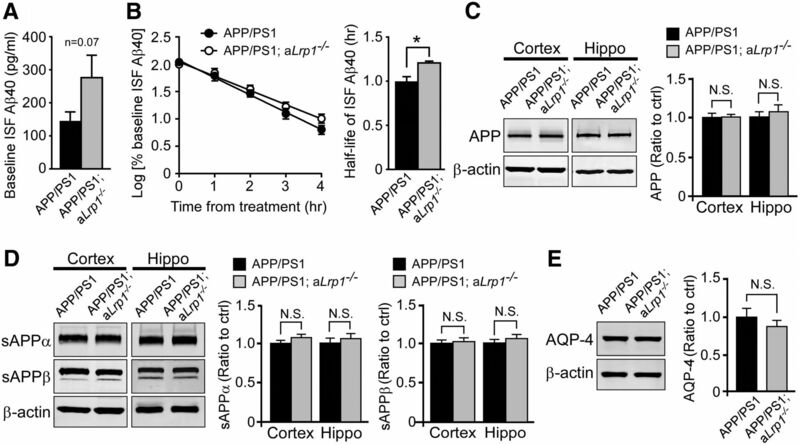 Consistent with increased amyloid deposition, the concentrations of insoluble Aβ40 and Aβ42 in guanidine fractions were increased in the cortex and hippocampus of APP/PS1; aLrp1−/− mice (Fig. 4B,C), suggesting that astrocytic LRP1 plays an important role in regulating amyloid deposition. Astrocytic LRP1 deletion in APP/PS1; aLrp1−/− mice. Astrocyte-specific LRP1-KO mice were generated by crossing the Lrp1flox/flox mice with GFAP-Cre mice, and further bred into an APP/PS1 background. A, Adult astrocytes were established from APP/PS1 and APP/PS1; aLrp1−/− mice (2–3 months of age). The astrocytes were costained with a rabbit anti-LRP1 antibody and a mouse anti-GFAP antibody. Scale bar, 50 μm. B, Brain LRP1 and apoE levels in the cortex (n = 9/group) and hippocampus (n = 6–10/group) of APP/PS1 and APP/PS1; aLrp1−/− mice were quantified by Western blot analysis. Data are mean ± SEM. **p < 0.01. C, Cortical and hippocampal slides from control APP/PS1 and APP/PS1; aLrp1−/− mice were costained with an LRP1 antibody and a neuronal marker anti-NeuN or an astrocyte marker anti-GFAP, respectively. Scale bar, 50 μm. The colocalization of the immunoreactivities of LRP1 and GFAP is abundant in sections from APP/PS1 mice but minimum in those from APP/PS1; aLrp1−/− mice. Colocalization with neuronal marker NeuN was not affected by astrocytic LRP1 deletion. 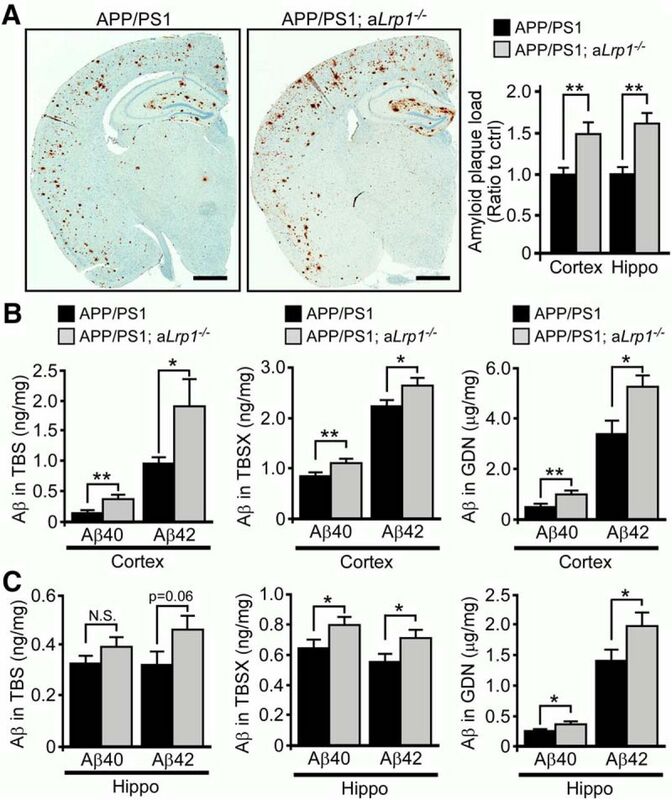 LRP1 deficiency in astrocytes enhances amyloid deposition in APP/PS1 mice. A, Brain sections obtained from 12-month-old APP/PS1 and APP/PS1; aLrp1−/− mice were immunostained for Aβ. Scale bar, 1 mm. The percentage of area covered by amyloid plaques was quantified. B, C, Cortical and hippocampal brain tissues were fractionated into TBS-soluble, detergent-soluble (TBSX), and insoluble (guanidine-HCl, GDN) fractions. Aβ levels from each fraction were quantified by ELISA. Data are mean ± SEM (n = 9 or 10/group). *p < 0.05 (two-tailed Student's t test). **p < 0.01 (two-tailed Student's t test). To determine whether astrocytic LRP1 affects Aβ metabolism in vivo, we first measured ISF Aβ concentration in the hippocampus of APP/PS1 and APP/PS1; aLrp1−/− mice at 3–4 months of age using in vivo microdialysis. Soluble Aβ found in ISF, which is exchangeable across a dialysis membrane, significantly correlates with total soluble Aβ in brain extracellular pools (Cirrito et al., 2003). Baseline concentrations of ISF Aβ40 trended higher in APP/PS1; aLrp1−/− mice, likely due to impaired Aβ clearance resulting from deletion of astrocytic LRP1 (Fig. 5A). To directly measure the elimination rate of ISF Aβ, mice were treated with a potent γ-secretase inhibitor to rapidly block Aβ production, and ISF Aβ was gradually decreased in a time-dependent manner. We found that the half-life of ISF Aβ40 was slightly but significantly increased in APP/PS1; aLrp1−/− mice (Fig. 5B), indicating that deletion of LRP1 in astrocytes may impair elimination of soluble Aβ from the ISF. To examine whether LRP1 deletion in astrocytes affects APP processing, the levels of full-length APP and APP processing products in both APP/PS1 and APP/PS1; aLrp1−/− mice were analyzed. No significant differences were observed between the respective amounts of full-length APP (Fig. 5C) and soluble forms of APP (sAPPα and sAPPβ; Fig. 5D) in 12-month-old APP/PS1 and APP/PS1; aLrp1−/− mice, suggesting that LRP1 expression does not significantly affect APP processing in these mice. In addition, previous study showed that deficiency of water channel reduces LRP1 levels in astrocytes and exacerbates brain Aβ plaque deposits (Xu et al., 2015). We thus examined whether LRP1 deficiency affects AQP-4 expression. We found that deletion of astrocytic LRP1 did not significantly affect AQP-4 level in APP/PS1; aLrp1−/− mice compared with littermate control mice at 12 months of age (Fig. 5E). LRP1 deficiency in astrocytes impairs Aβ clearance but not Aβ production in vivo. A, B, Aβ metabolism in the hippocampus of APP/PS1 and APP/PS1; aLrp1−/− mice (n = 4/group) at the age of 3–4 months was analyzed by in vivo microdialysis. A, Baseline Aβ40 levels were measured. To assess Aβ40 half-life, the mice were treated with a γ-secretase inhibitor, and the hippocampal ISF Aβ40 concentrations were monitored. B, The common logarithm of percentage baseline ISF Aβ40 concentrations versus time was plotted. The mean ISF Aβ elimination half-life (t1/2) was calculated for each mouse as the slope of the individual linear regressions from log (% ISF Aβ40) versus time. Data are mean ± SEM. *p < 0.05 (two-tailed Student's t test). C, D, Full-length APP (C) and sAPPα and sAPPβ levels (D) in the hippocampus and cortex of APP/PS1 and APP/PS1; aLrp1−/− mice (n = 8–10/group) at 12 months of age were analyzed by Western blotting and quantified. Data are mean ± SEM. E, AQP-4 in the cortex of APP/PS1 and APP/PS1; aLrp1−/− mice (n = 8–10/group) at 12 months of age were analyzed by Western blotting and quantified. Data are mean ± SEM. Given chronic brain inflammatory processes, mediated by the progressive activation of astrocytes and microglia with subsequent accumulation of proinflammatory cytokines, have been shown to contribute to AD pathogenesis (Wyss-Coray, 2006; Morales et al., 2014), we evaluated the inflammatory status in our astrocytic LRP1 knock-out amyloid mouse model. To examine the extent of astrogliosis in the mice, we immunostained brain sections obtained from APP/PS1; aLrp1−/− and APP/PS1 mice with an anti-GFAP antibody. Quantification of GFAP immunostaining clearly demonstrated increased activation of astrocytes in the brains of APP/PS1; aLrp1−/− mice compared with those of APP/PS1 mice at 12 months of age (Fig. 6A–C). The brain sections were also immunostained with anti-Iba1 antibody to examine the extent of microgliosis; dystrophic microglial reactivity was more evident in APP/PS1; aLrp1−/− mice (Fig. 6D–F). Western blot analysis also confirmed that GFAP was significantly upregulated in APP/PS1; aLrp1−/− mice (Fig. 6G). LRP1 deficiency in astrocytes in the absence of APP/PS1 background did not affect GFAP levels, indicating that the increased astrogliosis was attributed to an increase in Aβ accumulation and amyloid deposition in APP/PS1; aLrp1−/− mice (Fig. 6H). In addition, LRP1 deficiency in astrocytes led to an increase of TNF-α and interleukin-1β (Fig. 6I), important proinflammatory mediators involved in the development of AD (Morales et al., 2014). These findings demonstrate deletion of astrocytic LRP1 promotes increased neuroinflammation together with amyloid deposition. LRP1 deficiency in astrocytes leads to an increase in neuroinflammation. A–C, Brain sections from APP/PS1 and APP/PS1; aLrp1−/− mice (n = 8 or 9/group) at 12 months of age were immunostained for the astrocyte marker GFAP (A) and quantified (C). Scale bar, 1 mm. B, Higher-magnification images for GFAP immunostaining in the cortex and hippocampus. Scale bar, 200 μm. Data are mean ± SEM. *p < 0.05. D–F, Brain sections from APP/PS1 and APP/PS1; aLrp1−/− mice (n = 8 or 9/group) were immunostained for the microglia marker Iba1 (D) and quantified (F). Scale bar, 1 mm. E, Higher-magnification images for Iba1 immunostaining in the cortex and hippocampus. Scale bar, 200 μm. Data are mean ± SEM. *p < 0.05 (two-tailed Student's t test). **p < 0.01 (two-tailed Student's t test). G, GFAP in the cortex (n = 9/group) of APP/PS1 and APP/PS1; aLrp1−/− mice examined by Western blotting. Data are mean ± SEM. *p < 0.05. H, GFAP in the cortex (n = 8 or 9/group) of control and aLrp1−/− mice (in the absence of APP/PS1 background) examined by Western blotting. Data are mean ± SEM. I, TNF-α and interleukin-1β (IL-1β) in the cortex of APP/PS1 and APP/PS1; aLrp1−/− mice (n = 9/group) evaluated by real-time PCR. Data are mean ± SEM. *p < 0.05 (two-tailed Student's t test). The link between impaired Aβ metabolism and AD continues to be intensely investigated; however, the role of astrocytes in Aβ production and clearance has not been fully elucidated. Aβ accumulation in the brain, a result of an imbalance of its production and clearance, has been shown to trigger a pathogenic cascade (Hardy and Selkoe, 2002; Blennow et al., 2006; Zheng and Koo, 2011). Given that impaired clearance of Aβ is a major event in late-onset AD (Mawuenyega et al., 2010), which affects the vast majority of AD patients (Alzheimer'sAssociation, 2015), improved understanding of the pathways regulating Aβ clearance may help to establish new targets for therapy and prevention. In this study, we sought to examine the molecular mechanisms of astrocyte-mediated Aβ metabolism in vivo. We found that LRP1 in primary astrocytes mediates the uptake and degradation of Aβ and regulates the levels of Aβ-degrading enzymes. Our in vivo work using conditional knock-out mouse models deleting LRP1 in astrocytes in the background of amyloid model revealed a clear role of astrocytic LRP1 in brain Aβ clearance impacting both amyloid pathology and neuroinflammation. Our findings demonstrate a critical role of LRP1 in astrocyte-mediated Aβ clearance in AD pathogenesis. Aβ is cleared in the brain by multiple pathways, including intracellular degradation by various brain cell types, and extracellular degradation by Aβ-degrading enzymes (Bu, 2009). Upon cellular Aβ internalization, the majority of Aβ is quickly delivered to lysosomes and efficiently degraded (Mandrekar et al., 2009; Li et al., 2012). LRP1 is characterized by its rapid enocytotic ability to mediate cellular uptake of a variety of ligands, including apoE, α2-macroglobulin, and tissue plasminogen activator (Herz and Strickland, 2001; Bu, 2009). Although it is controversial whether LRP1 can directly bind to Aβ (Sagare et al., 2007; Yamada et al., 2008), LRP1 clearly regulates the endocytosis of Aβ, albeit with a slower kinetics compared with that of another LRP1 ligand RAP (Kanekiyo et al., 2011). Using a strain of GFAP-Cre mice that express Cre early in neurogenesis with the expectation to delete LRP1 in both neurons and glial cells, a previous study showed that reduced LRP1 expression in the hippocampal neurons by ∼50% results in early lethality in mice with no significant impact on plaque deposition (Xu et al., 2012). Utilization of the GFAP-Cre mice here (Bajenaru et al., 2002), this resulted in deletion of LRP1 in GFAP-positive astrocytes but not in NeuN-positive neurons. The discrepancy might be due to differences in Cre mouse strains, gene knock-out specificity, or efficiency. By breeding Lrp1 floxed mice with calcium/calmodulin-dependent protein kinase IIα (αCaMKII-Cre) mice, our previous study showed that LRP1 depletion in adult forebrain neurons impairs Aβ clearance (Kanekiyo et al., 2013). However, the role of astrocytic LRP1 in Aβ metabolism in vivo has not been specifically addressed. Several in vitro studies have implicated an important role of astrocytes in cellular Aβ metabolism. When transcription factor EB was overexpressed in astrocytes using adeno-associated virus-mediated gene delivery method in the hippocampus of APP/PS1 mice, Aβ clearance was facilitated by enhancing lysosome biogenesis, resulting in reduced amyloid plaque load (Xiao et al., 2014). In human glioblastoma cells, Aβ42 is shown to be internalized through fluid phase macropinocytosis, transported to lysosomes, and subjected to proteolysis, where LRP1 mediates the uptake of soluble Aβ42 more efficiently than that of Aβ42 aggregates (Li et al., 2014). RAP, an antagonist of the LDLR family members, effectively blocks astrocyte-mediated Aβ degradation in brain sections from amyloid model mice (Koistinaho et al., 2004). We found that deletion of LRP1 in astrocytes disturbed ISF Aβ clearance and increased the levels of soluble Aβ as well as insoluble Aβ in the brains of APP/PS1 mice. Although further studies are needed, LRP1 in astrocytes likely plays a critical role in the clearance of both soluble and insoluble Aβ. ApoE is a critical LRP1 ligand, which significantly contributes to Aβ pathology in AD pathogenesis (Bu, 2009; Liu et al., 2013; Hu et al., 2015). Deficiency of apoE significantly facilitates ISF Aβ clearance in PDAPP mice (DeMattos et al., 2004). Furthermore, anti-apoE immunotherapy also ameliorates Aβ accumulation in APP/PS1 mice (Kim et al., 2012). Although multiple pathways might be involved in the mechanisms, apoE has been shown to compete with soluble Aβ for LRP1-dependent cellular uptake in astrocytes (Verghese et al., 2013). Thus, endogenous apoE may compromise extracellular metabolism of soluble Aβ by blocking the astrocytic LRP1-mediated pathways. A recent study also showed that the phagocytic capacity of astrocytes is highly dependent on APOE isoforms (Chung et al., 2016). Whether LRP1 mediates apoE-regulated phagocytic capacity of astrocytes in synaptic pruning, and degradation of neuronal debris and amyloid warrants further investigation. Previous studies suggest that LRP1 modulates APP endocytic trafficking, which influences Aβ production in various cellular models (Ulery et al., 2000; Cam et al., 2005). In addition, recent in vivo studies demonstrated that LRP1 plays an important role in modulating Aβ clearance. For instance, deletion of LRP1 in neurons or vascular mural cells suppresses Aβ clearance in APP/PS1 mice without affecting APP processing (Kanekiyo et al., 2012, 2013). 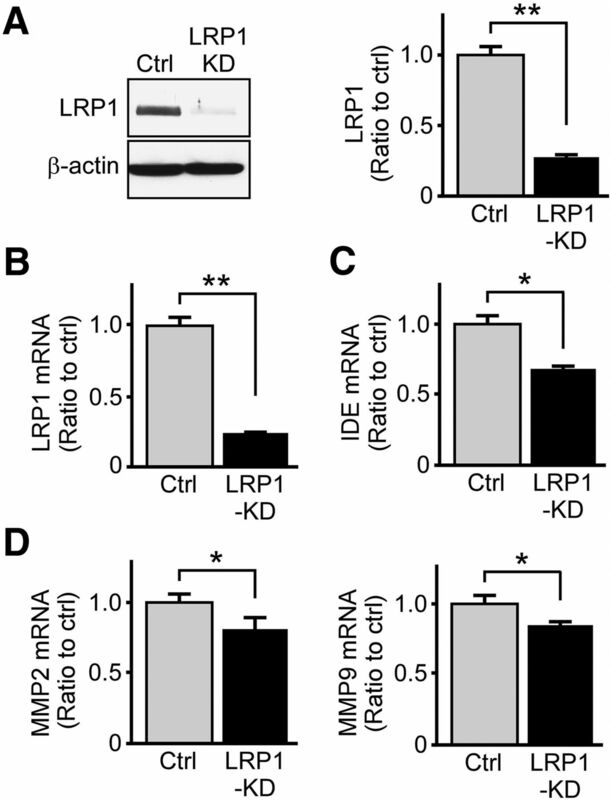 Also, LRP1 mediates Aβ clearance across the blood–brain barrier (Ramanathan et al., 2015). These studies suggest that LRP1 may exhibit differential functions in regulating Aβ metabolism depending on cell types and the model systems. Astrocytes represent a major cell type mediating the elimination of Aβ in the brain. In our present study, deficiency of LRP1 in astrocytes disturbed Aβ clearance, suggesting that the effect of LRP1 on Aβ clearance may be dominant over its potentially minor role in Aβ production in astrocytes. Together, these studies establish a critical role of LRP1 in different brain cell types in brain Aβ clearance. Several Aβ degrading enzymes are abundantly expressed in astrocytes (Mulder et al., 2012). In addition to cellular Aβ clearance, extracellular proteolytic degradation of Aβ mediated by enzymes, such as neprilysin, IDE, and MMPs, also represents an important pathway in Aβ metabolism (Saido and Leissring, 2012). LRP1 plays an important role in regulating MMP expression and functions (Etique et al., 2013). Hepatic LRP1 was suggested to facilitate Aβ degradation via various Aβ-degrading enzymes (Dries et al., 2012). Postmortem AD cortical brain tissues exhibit decreased levels of both LRP1 and IDE compared with those of normal aging or pathological aging individuals (Shinohara et al., 2014). In addition, IDE-mediated degradation of Aβ is regulated by astrocytic apoE, a ligand for LRP1 (Jiang et al., 2008). Here, we found that knockdown of LRP1 resulted in reduced mRNA levels of IDE, MMP2, and MMP9 in primary astrocytes. Although further studies are needed to determine the molecular mechanisms underlying the interaction between LRP1 and the regulation of these enzymes, LRP1 may prevent Aβ deposition by facilitating cellular Aβ uptake and enzymatic Aβ degradation in astrocytes. Given accumulating evidence revealing the contribution of cerebrovascular damage to AD pathogenesis (Zlokovic, 2011; Nelson et al., 2016), and that end-feet of astrocytes surround cerebrovasculature to maintain blood–brain barrier integrity (Osborn et al., 2016), future studies investigating the role of astrocytic LRP1 in cerebrovascular Aβ clearance may be warranted. For example, the water channel AQP-4, predominantly expressed in the end-feet of astrocytes, regulates Aβ accumulation, cerebral amyloid angiopathy, and synapses in APP/PS1 mice (Xu et al., 2015). Of note, deletion of AQP-4 has been shown to increase astrocyte atrophy and suppresses LRP1 expression in the astrocytes surrounding Aβ plaques (Yang et al., 2012; Xu et al., 2015). Our results showed that deletion of LRP1 in the astrocytes did not significantly alter the levels of AQP-4, suggesting that AQP-4 may function in the upstream of LRP1 in astrocytes. However, we cannot rule out the possibility that astrocytic LRP1 and AQP-4 function cooperatively in mediating ISF Aβ clearance along the cerebrovasculature drainage pathway. Future studies are needed to understand whether LRP1 and AQP-4 exhibit a functional interaction and whether upregulation of LRP1 expression and/or function in astrocytes can rescue the deficits of Aβ metabolism resulted from AQP-4 deficiency. In conclusion, we demonstrate the significant contribution of astrocytic LRP1 to Aβ metabolism using both in vitro and in vivo models, thereby expanding upon recent findings of LRP1's critical role in neurons (Kanekiyo et al., 2013), vascular mural cells (Kanekiyo et al., 2012), and endothelial cells (Storck et al., 2016). Astrocytic LRP1 deficiency results in impaired ISF Aβ elimination and aggravated Aβ deposition in the brains of APP/PS1 mice; the suppression of both astrocytic intracellular degradation and extracellular clearance of Aβ via Aβ degrading enzymes likely mediates these effects. 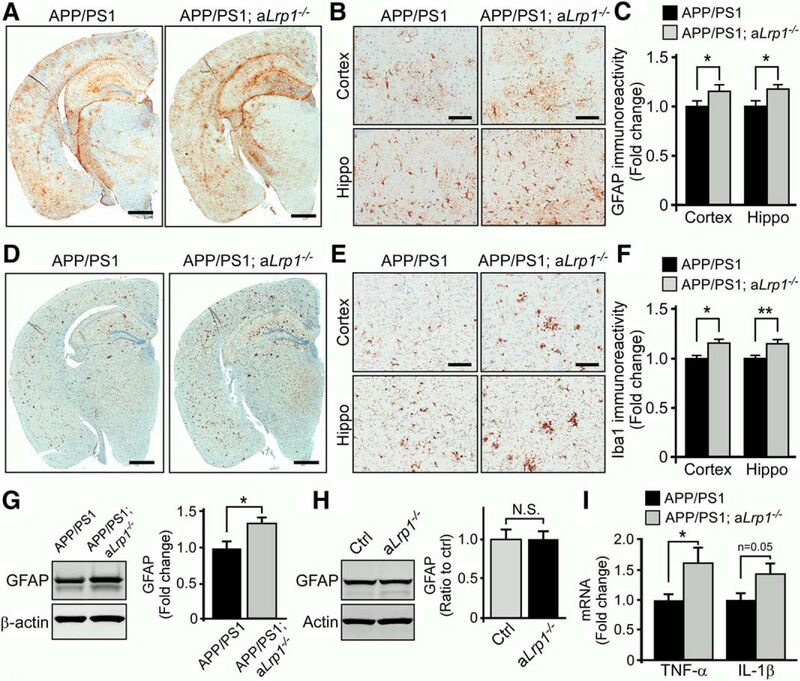 Given that LRP1 levels are shown to be decreased in AD brains compared with control individuals (Kang et al., 2000), restoring LRP1 expression and functions could be an effective strategy to facilitate Aβ clearance and counter amyloid pathology in AD. Future studies designed to develop pharmacological approaches and gene therapies targeting astrocytic LRP1 may hold promises as means to combat AD. This work was supported by National Institutes of Health Grants R01AG027924, R01AG046205, RF1AG051504, R01AG035355, and P50AG016574 to G.B., P01NS074969 to G.B., J.R.C., and D.M.H., Cure Alzheimer's Foundation Grant to G.B., American Heart Association Grant 15SDG22460003 to T.K., and American Heart Association Fellowship to C.-C.L. We thank Dr. Mingjie Li and Nada Husic (Washington University Viral Vectors Core) for producing the lentiviruses; Dr. Pritam Das for providing the γ-secretase inhibitor LY411575; and Dr. Dennis Dickson, Monica Castanedes Casey, Linda Rousseau, and Virginia Phillips for histology and immunohistochemical analyses.